Providing you the best range of re-refining plant by wiped film evaporation with effective & timely delivery. 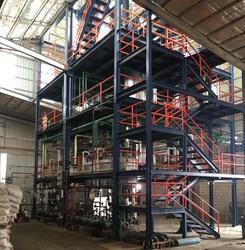 Re-Refining Plant by Wiped Film Evaporation: The Wiped Film Evaporator is widely used world over for re-refining of used lubricating oil . This is supplied as a continuous or a semi continuous plant depending upon the capacity and the location of the plant .The minimum distance between the evaporating surface and the condenser coupled with short residence time makes this process one of the best in the market. The clay treatment, regenerative clay process or solvent extraction can be used for the purpose of polishing the distilled product, which is obtained from evaporation process, into supreme grade base oil of different viscosities. Looking for Re-Refining Plant by Wiped Film Evaporation ?